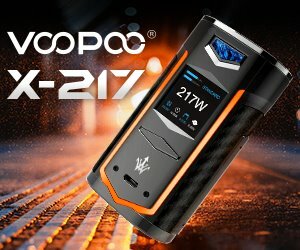 If you’re not very familiar with SMOK box mods, their new H-Priv 220V TC device must come across as a very different and intriguing design, but if you’ve been following their older releases, you can almost immediately tell that the H-Priv is actually a combination between two of their most popular units – the highly acclaimed X Cube 2 and the compact yet very powerful R200 – both of which I’ve had the pleasure to review in the past. As far as I can tell, with the H-Priv SMOK have basically taken the strengths of their previous two releases and combined them to create an overall superior device. 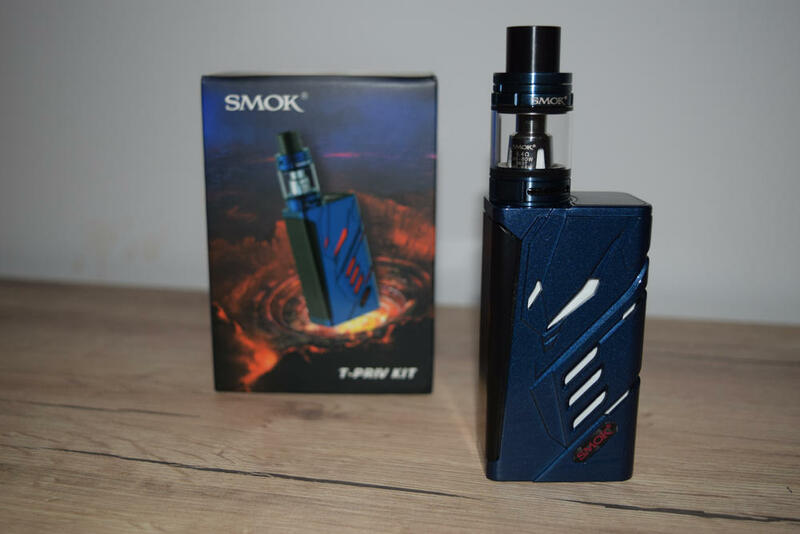 SMOK is currently selling the H-Priv mod both as a standalone unit, as well as a starter kit, in which it comes bundled with the TFV4 Micro, a scaled-down version of the original SMOK TFV4 sub-ohm tank. I was sent the latter, so let’s start by taking a look at what you get in the box: the H-Priv 220W box mod, a TFV4 Micro tank, two SMOK coil heads – a pre-installed 0.3Ω Clapton coil and an 0.25Ω dual stainless steel coil – a replacement glass tube which also acts an extension, allowing you to fit in an extra milliliter of juice, an extension adapter, a USB data cable that can be used for firmware updates, a rubber vape band to protect your glass tank, a user manual, and a small bag of spare parts for the tank. All-in-all a complete package at a very competitive price, which is what we have come to expect from the Chinese company in recent years. The H-Priv mod is without a doubt the star of this kit. 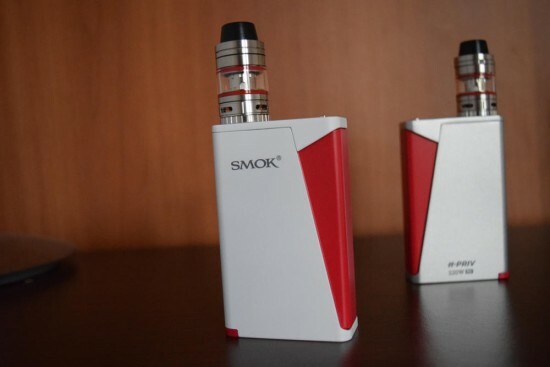 Design-wise, it is one of the best-looking devices I have ever used, borrowing the most appealing elements of the SMOK X Cube 2 and SMOK R200 TC and combining them in three very inspired color schemes – black with red trim, white with red trim and silver with red trim. If I had to choose, I would definitely go for the black and red, but that’s just a subjective choice. SMOK were kind enough to send me all three variants and I can tell you that they all look stunning. Ever since the X Cube 2 came out last year, I knew they had a very talented and creative design team, and they confirmed my opinion with the R200, but the H-Priv is their best work yet. Let’s start with the things the H-Priv has in common with the X Cube 2. 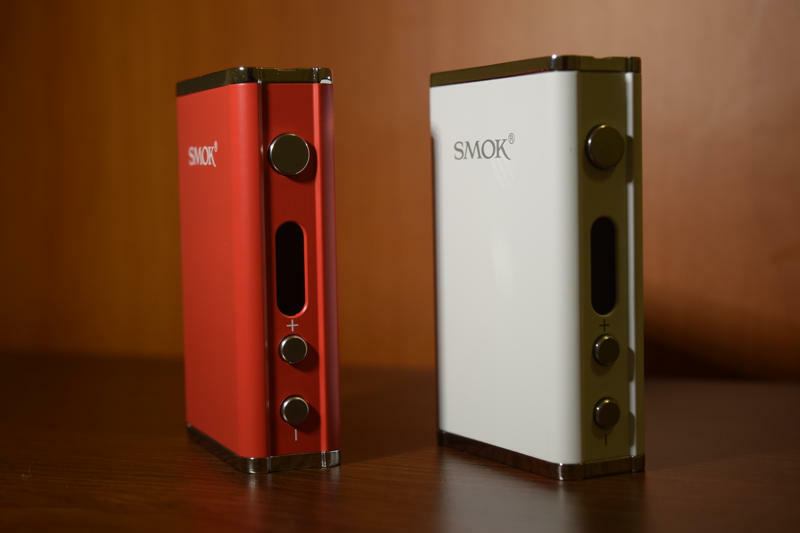 First of all, there is the signature SMOK firing bar that replaces the classic power button found on most box mods. 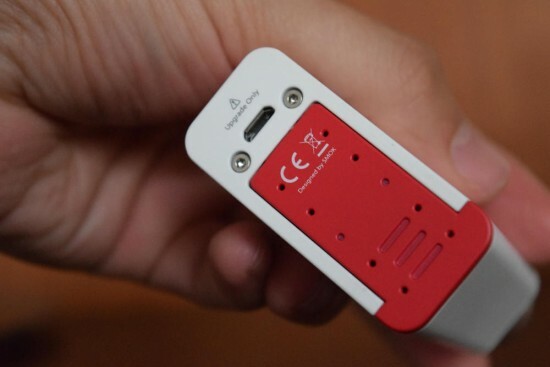 The red triangle that covers one of the side of the device is actually the firing mechanism, and all you have to do is squeeze the unit gently in your hand to activate the batteries. It doesn’t matter if the triangle faces your palm or your fingers, it works just as well regardless of how you’re holding it. The big difference from the X Cube 2 is that they’ve gotten rid of the gimmicky LED light show that would come on whenever you pressed the firing bar. It was pretty cool if you ask me, but it didn’t affect the performance of the device in any way and used up some power unnecessarily, so some may see its absence on the H-Priv as an improvement. 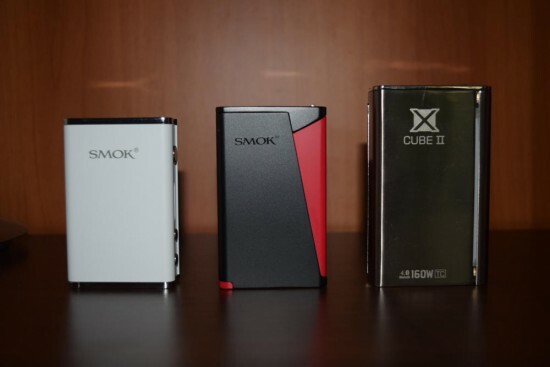 Secondly, the new SMOK H-Priv has the same style buttons and display as the X Cube 2, plus they are located in the same place – on the top side of the device, right next to the 510 connection. The protective glass screen of the OLED display seems considerably larger on the newer device, but the display itself is identical to the one on the X Cube 2. I will say that the positioning of the display is pretty convenient, allowing you to see all the info even while you’re vaping, but it does open it up to damage from potential leaking. Now, SMOK have confirmed that the protective glass keeps juice getting into the display, but the buttons don’t seem insulated in any way, and unlike the X Cube 2, which had a cast metal body, the H-Priv has the top section screwed to the rest of the casing with screws, and where it meets the main body, you can actually see these small cracks through which leaking juice and dust could definitely find their way inside. It’s not a big con, but it’s easily fixable so SMOK should definitely be looking into it. 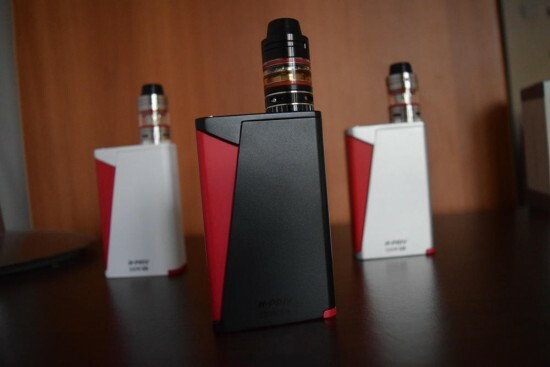 From the SMOK R200, the new H-Priv borrows the general shape – apart from the firing bar, obviously – and the sliding battery cover on the bottom of the unit. I was not a big fan of this battery door, simply because it was pain to slide back in after removing it to change batteries, and that hasn’t improved on the H-Priv. Plus it’s really small and detaches completely, so it’s easy to misplace. I liked the magnetic cover on the X Cube 2 better, to be honest, but the perfect solution would be a hinged bottom cover like the one on the recently reviewed Vaptio S150. Finally, the last detail worth mentioning is the micro-USB port on the bottom of the H-Priv mod, which can only be used for firmware updates, not for on-board battery charging. You’re going to need an external battery charger for that. 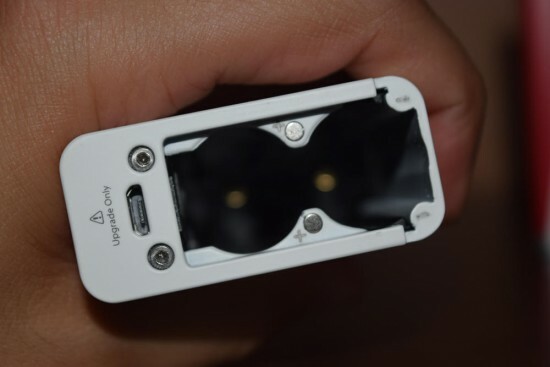 This upgrade port is actually a very important part of all SMOK devices in general, as several of the Chinese company’s previous releases required software updates to fix certain issues immediately after launch. Sadly, the H-Priv is no exception, but more on that later. 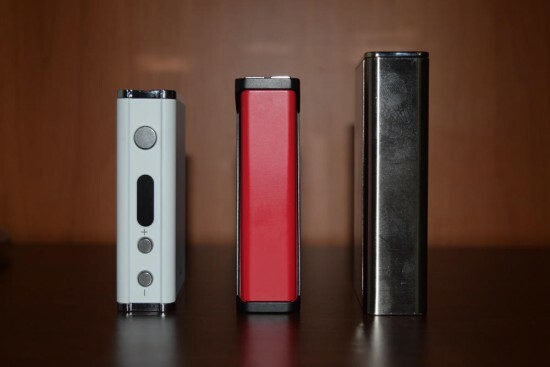 At 91 x 55 x 25 mm, the H-Priv 220W box mod is 9 mm shorter than the X Cube 2 and 6 mm taller than the R200. At 190 grams, it’s also 48.6 grams lighter than the X Cube 2 and 62 grams heavier than the R200. I guess you could say it’s somewhere in between the two devices that inspired it, in terms of size and weight. Apart from the small cracks I mentioned earlier, build quality is top notch. The zinc alloy body has a matte finish in all three colors and feels great in the hand. There is no rattling whatsoever either from the buttons or the battery cover and it just has a sturdy feel that screams quality. One thing I recommend, though, is to get some kind of protective case or sleeve, because the paint does chip away when the device comes in contact with hard objects like coins or keys, and ruins the perfect look of the mod. 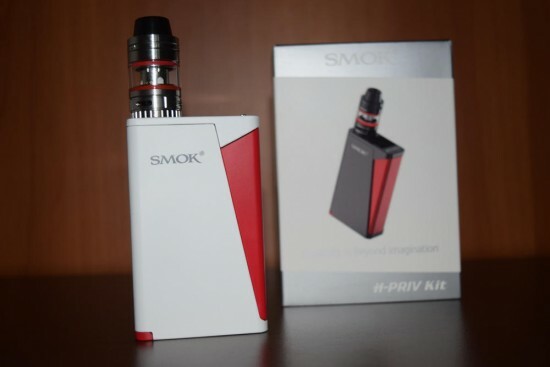 I am not going to go very deep into the menu and button combinations of the SMOK H-Priv simply because they are virtually identical to those of the X-Cube 2. You turn the device on and off by pressing the firing bar five times in rapid succession, and access the settings menu by pressing it three times rapidly. There, you can choose between different modes (wattage mode, temperature control and memory mode), select coil material for TC (Ni200, titanium and stainless steel), reset the puff counter, set the initial resistance of the atomizer, change the orientation of the display, adjust its brightness. 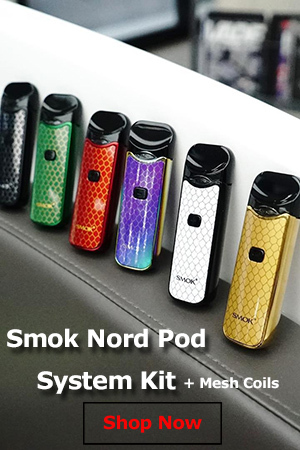 It also comes with the SMOK five Special Draw Effects – ‘Min.’, ‘Soft’, ‘Norm.’, ‘Hard’ or ‘Max’ – that let you customize your vaping experience, which have become a staple in all of the company’s advanced mods. The display shows the current wattage/temperature – depending on which mode you’re in – the usual battery life icon, atomizer resistance, number of puffs taken since the last reset and the real-time voltage. As I said, it’s exactly the same display as on the X Cube 2. It also shares its main flaw – a relative dimness of the screen, which is not a huge deal, though, as in normal lighting conditions everything is perfectly visible. Direct sunlight is another issue, however. 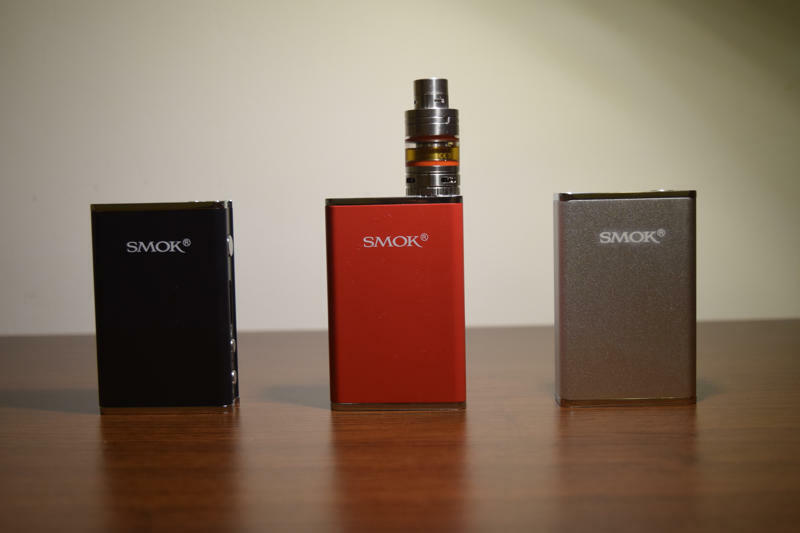 Performance-wise, the SMOK H-Priv has proven just as reliable as the X Cube 2 and R200. With a maximum power output of 220W, it’s the most powerful vaporizer I have ever used, although I haven’t taken it to the limit or anywhere close to it, and don’t plan on ever doing so. 220W is an insane level for me. To be honest, 100W is a lot more than I usually enjoy vaping at. I’ve mainly been using the H-Priv with the included Micro TFV4 tank at 50W, and never felt the need of upping the wattage. I’ve also tried it with my Nixon RDA, but only pushed it to about 80W. I simply can’t imagine how someone can handle 220W, but I guess this increasingly higher wattage trend is an issue of availability rather than practicality. You’re probably never going to use so much power, but it’s nice to know it’s available if you ever want to fry your lungs. The H-Priv does come with one very serious flaw, though. Just like the X Cube 2 when it first came out, this mod has a very annoying firing delay. It takes about a second for the batteries to get activated and start heating the coils. A second may not seem like a lot, but this is a huge delay, trust me. In order to get a proper hit, you have to prime the coils by pressing the firing bar a second before drawing on the drip tip. It’s a decent workaround, but you shouldn’t have to deal with it. Luckily, SMOK is already working on a fix. Even before I started writing this review, they contacted me about this issue, saying that the delay was purposely implemented to prevent the H-Priv from firing instantly when the user presses the fire bar three times to access the menu, or five times to turn it off. So, if it detects a longer continuous press, it fires, if not, it doesn’t. I guess it makes sense, theoretically, but having used many other devices that used the same three and five-press system, yet had almost no delay in firing, I think they could have come up with a better solution. Anyway, after receiving negative feedback regarding this issue, SMOK started working on a firmware update. They sent it to me last week and it did fix the problem. However, last I checked, the update wasn’t yet available for download on their site. It’s just a matter of time though, so hold tight. I’ve never been a big fan of temperature control vaping, but I know a lot of people are into it, so for the purpose of providing an informative review, I did mess around with this feature, but only just a little. I performed the dry cotton test using some stainless steel wire I had lying around in one of my many vape-stuff boxes and it passed with flying colors. The cotton did get a darker brown hue when cranking the temperature to 600 degrees Fahrenheit, but that’s normal. The important thing is it didn’t catch fire, which means the H-Priv was controlling the temperature the way it was supposed to. I also used the device in TC mode with the included stainless steel coil head and it worked ok. I still prefer using it in wattage mode, though. Talking about the battery life of a device like the SMOK H-Priv is really tricky, because it depends on a variety of factors, like what wattage/temperature you are using it at, how much you vape and battery mAh rating. All I can tell you is that I’ve been using it almost exclusively for the last two weeks, with two LG HG2 INR 3,000 mAh batteries, and it lasts me over a day, sometimes up two a day and a half. I consider myself a heavy vaper, but maybe I’m subjective. Anyway, like any dual 18650 battery mod, you can expect great battery life from the H-Priv. Regarding the included Micro TFV4, there’s really not much to say that hasn’t been said before in my reviews of the SMOK R80 and the SMOK Stick One Plus. 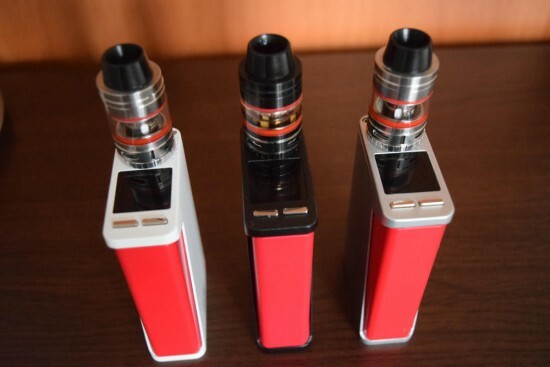 Those two kits come with same tank as the new H-Priv 220W TC package, so if you want to read more about it, check my reviews of them. In short, it’s a smaller version of the original TFV4, holds 2.5ml of juice, or 3.5 with the larger glass tube and included extension adapter, and produces insane amounts of vapor for its size, even at lower wattage levels. As all TFV4 series tanks, it is also very, very thirsty, so make sure you stock up on juice if you intend to use it on a regular basis. The one difference that really sticks out between the Micro TFV4 that comes in the SMOK H-Priv starter kit and the ones I’ve seen in the past is the wide boar delrin drip tip. I can say I prefer it over the patented SMOK double-layered metal ones, but it’s just a matter of taste. You can use whatever drip tip you want with it. The Micro TFV4 is compatible with all micro TFV4 coil heads, as well as two – one single coil and one dual coil – RBA decks that SMOK sells separately. That’s a really big deal if you intend on building your own coils at one point, as it saves you a decent amount of money in additional gear. The SMOK H-Priv starter kit – the one that comes with the tank – currently sells for around $65, which is a great deal, if you ask me. You get a state of the art advanced mod that not only looks amazing, but is also packed full of features, is sturdy and performs very well. Once the delay issue is fixed, which should happen any day now, I really won’t be able to come up with a reason not to recommend the H-Priv. If you’re in the market for a high-power compact box mod that does temperature control and is firmware upgradable, be sure to check out this amazing device.